***Foster or Foster to adopt home needed*** Meet Rusty(left) and Gracie(right) these two wonderful dogs are bonded. They are Retriever mixes, Rusty is 6 yrs. old and Gracie is 2 yrs. old. Rusty is protective of Gracie around other animals so the foster home will need to have no other pets. They came to us from a different shelter after the foster home they were in took them to the pound after a little fight with Rusty and their dog. The reason we need a foster home is we had Gracie tested and she is Heart worm + and will need treatment. These two are housebroken and are great dogs. If you would like to foster or foster to adopt and would like to meet them stop out to the shelter Tues.-Sat. 12pm-6:30pm. Meet Tasha! She is a 4 yr. old Great Pyrenees/Husky/boxer mix weighing in at 48 pounds. She came to us from another shelter after her owner had to give her up because the landlord said no big dogs. She is housebroken and good with other dogs. The adoption fee for Tasha is $175. This includes spay/neuter, rabies, distemper, bordatella, flea treatment, worming, testing for heartworms and treatment, and microchiping. If you are interested in meeting Tasha, please visit the shelter at 22407 Bus Hwy 151 on the outskirts of Monticello during normal business hours which are Tuesday thru Saturday, noon to 6:30pm. If you have any further questions, you can call 319-975-8283. BREED DISCLAIMER: Many dogs come to us as strays and therefore, we are unsure of their breed. We may actually list a pure bred as a mix because we truly do not know their origins or background and we often must guess at their breed. Look at that face. This is Roman and he is waiting for his forever family to come in and adopt him! He is a hound mix around 4 yrs. old, weighing 45 pounds, and came in as a stray in Jones Co. He appears to be good with other dogs. He doesn't appear to know any commands but is treat motivated which should make training easier. He doesn't talk much and seems to like everyone. The adoption fee for Roman is $175. This includes spay/neuter, rabies, distemper, bordatella, flea treatment, worming, testing for heartworms and treatment, and microchiping. If you are interested in meeting Roman, please visit the shelter at 22407 Bus Hwy 151 on the outskirts of Monticello during normal business hours which are Tuesday thru Saturday, noon to 6:30pm. If you have any further questions, you can call 319-975-8283. BREED DISCLAIMER: Many dogs come to us as strays and therefore, we are unsure of their breed. We may actually list a pure bred as a mix because we truly do not know their origins or background and we often must guess at their breed. Blondie is a female puggle who was born around March 2009. The adoption fee for Blondie is $125. This includes spay/neuter, rabies, distemper, bordatella, flea treatment, worming, testing for heartworms and treatment, and microchiping. 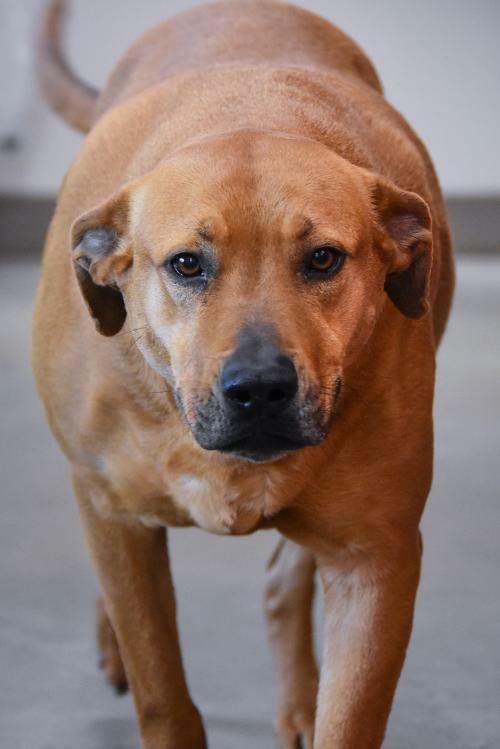 If you are interested in meeting Blondie, please visit the shelter at 22407 Bus Hwy 151 on the outskirts of Monticello during normal business hours which are Tuesday thru Saturday, noon to 6:30pm. If you have any further questions, you can call 319-975-8283. BREED DISCLAIMER: Many dogs come to us as strays and therefore, we are unsure of their breed. We may actually list a pure bred as a mix because we truly do not know their origins or background and we often must guess at their breed. Look at this handsome dude!!! This is Boone, he is a 2 yr. old hound mix. He came to us as a stray. His only down fall is he likes to climb fences other then that is a real sweetie. The adoption fee for Boone is $175. This includes spay/neuter, rabies, distemper, bordatella, flea treatment, worming, testing for heartworms and treatment, and microchiping. If you are interested in meeting Boone, please visit the shelter at 22407 Bus Hwy 151 on the outskirts of Monticello during normal business hours which are Tuesday thru Saturday, noon to 6:30pm. If you have any further questions, you can call 319-975-8283. BREED DISCLAIMER: Many dogs come to us as strays and therefore, we are unsure of their breed. We may actually list a pure bred as a mix because we truly do not know their origins or background and we often must guess at their breed. 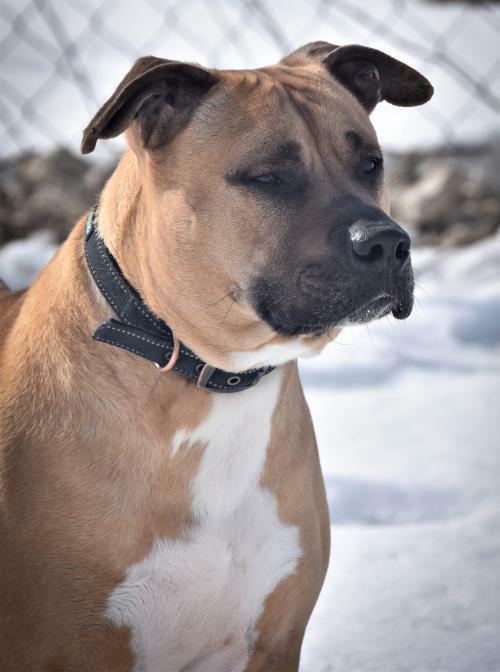 Gemmy is a female pit/lab mix who was born around March 2012 and weights 58 pounds. The adoption fee for Gemmy is $125. This includes spay/neuter, rabies, distemper, bordatella, flea treatment, worming, testing for heartworms and treatment, and microchiping. If you are interested in meeting Gemmy, please visit the shelter at 22407 Bus Hwy 151 on the outskirts of Monticello during normal business hours which are Tuesday thru Saturday, noon to 6:30pm. If you have any further questions, you can call 319-975-8283. BREED DISCLAIMER: Many dogs come to us as strays and therefore, we are unsure of their breed. We may actually list a pure bred as a mix because we truly do not know their origins or background and we often must guess at their breed. 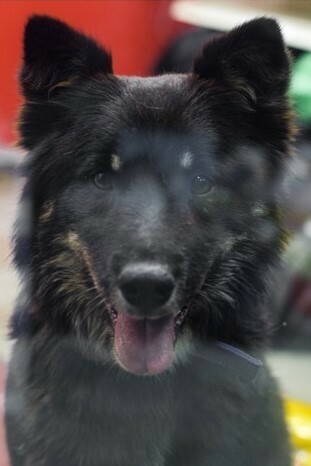 Sadie2 is a female shepherd mix who was born around October 2017 and weights 42 pounds. She is a little unsure around strangers, but once she gets to know you she is a wonderful addition to any family. You need to go slow with her at first to let her destress, but she was in a foster home with a 2 year old child and was fine. She is housebroken. No cats. The adoption fee for Sadie2 is $175. This includes spay/neuter, rabies, distemper, bordatella, flea treatment, worming, testing for heartworms and treatment, and microchiping. 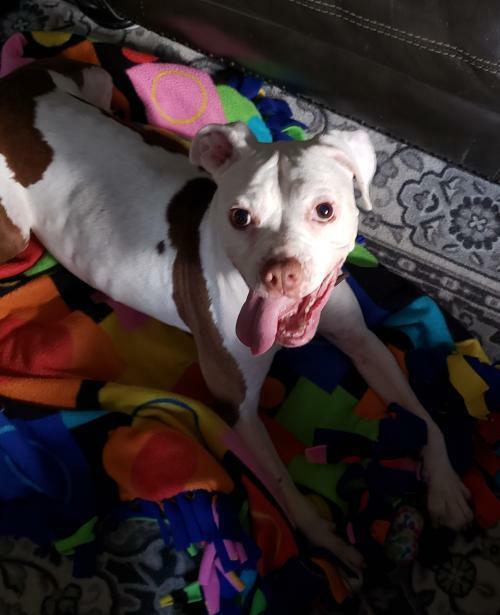 If you are interested in meeting Sadie2, please visit the shelter at 22407 Bus Hwy 151 on the outskirts of Monticello during normal business hours which are Tuesday thru Saturday, noon to 6:30pm. If you have any further questions, you can call 319-975-8283. BREED DISCLAIMER: Many dogs come to us as strays and therefore, we are unsure of their breed. We may actually list a pure bred as a mix because we truly do not know their origins or background and we often must guess at their breed. Bailey is a female Black & Tan Coonhound who was born around March 2014 and weights 55 pounds. The adoption fee for Bailey is $175. This includes spay/neuter, rabies, distemper, bordatella, flea treatment, worming, testing for heartworms and treatment, and microchiping. If you are interested in meeting Bailey, please visit the shelter at 22407 Bus Hwy 151 on the outskirts of Monticello during normal business hours which are Tuesday thru Saturday, noon to 6:30pm. If you have any further questions, you can call 319-975-8283. BREED DISCLAIMER: Many dogs come to us as strays and therefore, we are unsure of their breed. We may actually list a pure bred as a mix because we truly do not know their origins or background and we often must guess at their breed. 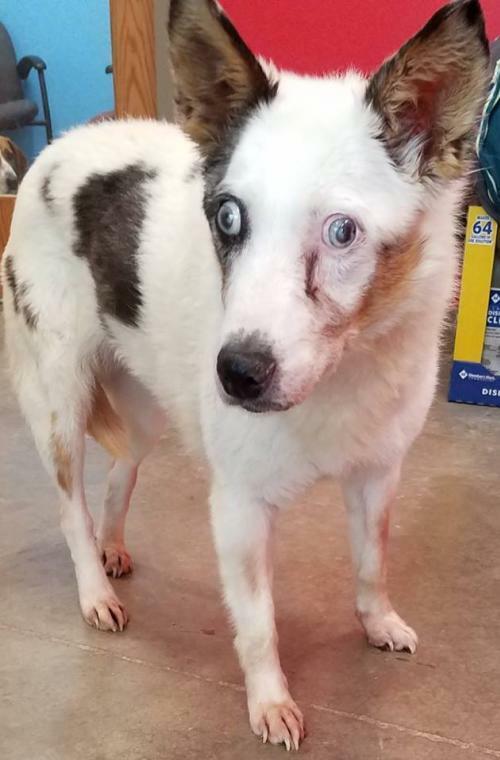 Spook is a female cattle dog who is probably between 10 and 12 years old and weights 21 pounds. She is blind and moves slowly. She needs a quiet, organized home for her final years. The adoption fee for Spook is $125. This includes spay/neuter, rabies, distemper, bordatella, flea treatment, worming, testing for heartworms and treatment, and microchiping. If you are interested in meeting Spook, please visit the shelter at 22407 Bus Hwy 151 on the outskirts of Monticello during normal business hours which are Tuesday thru Saturday, noon to 6:30pm. If you have any further questions, you can call 319-975-8283. BREED DISCLAIMER: Many dogs come to us as strays and therefore, we are unsure of their breed. We may actually list a pure bred as a mix because we truly do not know their origins or background and we often must guess at their breed. 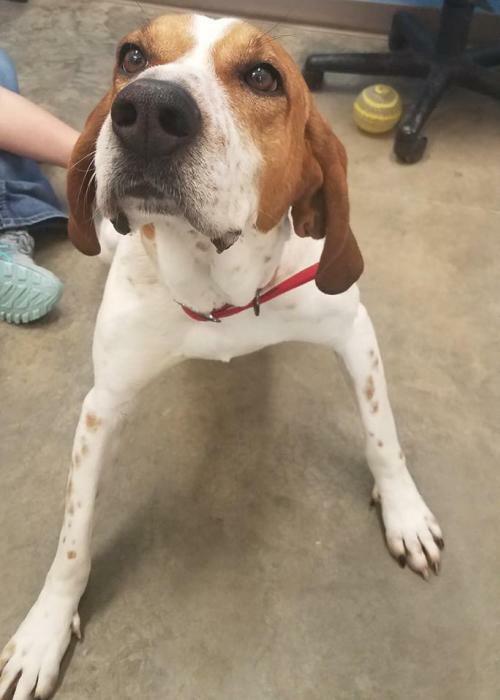 Ranger is a male English coonhound mix who was born around February 2017 and weights 68 pounds. He came to us from another shelter. He appears to have some food aggression issues and a little with toys. The adoption fee for Ranger is $175. This includes spay/neuter, rabies, distemper, bordatella, flea treatment, worming, testing for heartworms and treatment, and microchiping. 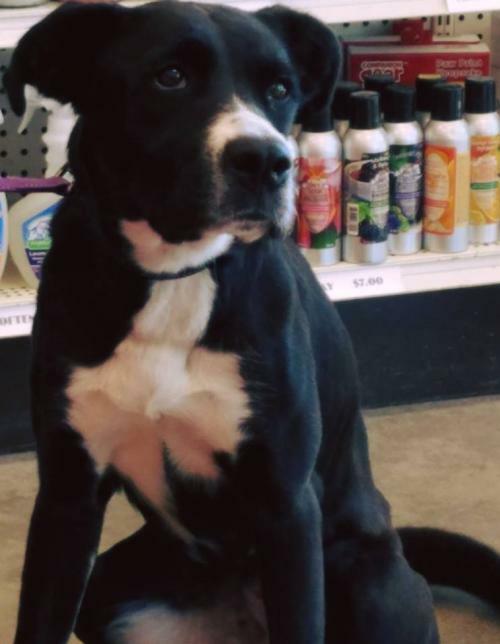 If you are interested in meeting Ranger, please visit the shelter at 22407 Bus Hwy 151 on the outskirts of Monticello during normal business hours which are Tuesday thru Saturday, noon to 6:30pm. If you have any further questions, you can call 319-975-8283. BREED DISCLAIMER: Many dogs come to us as strays and therefore, we are unsure of their breed. We may actually list a pure bred as a mix because we truly do not know their origins or background and we often must guess at their breed. 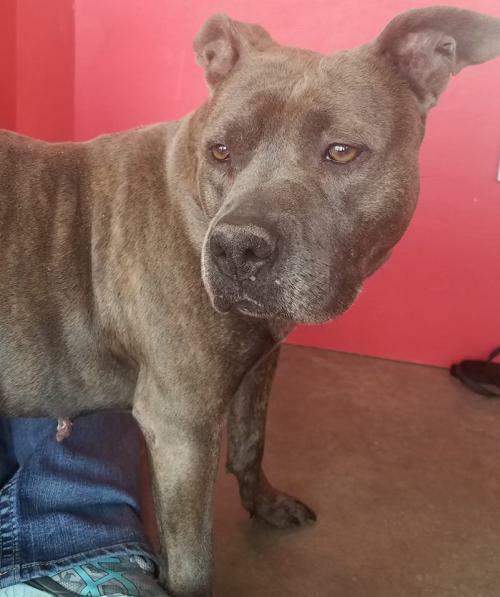 Snickers is a female Pit bull who was born around October 2015 and weights 45 pounds. She can not be placed with cats. The adoption fee for Snickers is $175. This includes spay/neuter, rabies, distemper, bordatella, flea treatment, worming, testing for heartworms and treatment, and microchiping. 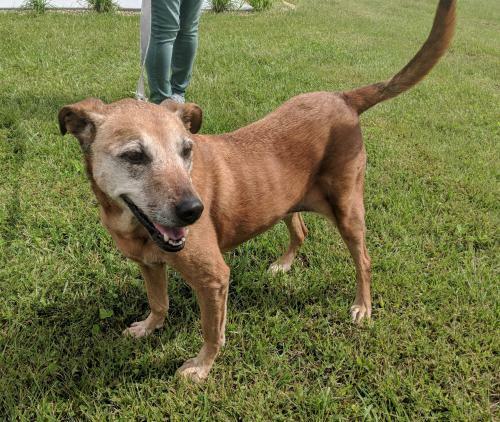 If you are interested in meeting Snickers, please visit the shelter at 22407 Bus Hwy 151 on the outskirts of Monticello during normal business hours which are Tuesday thru Saturday, noon to 6:30pm. If you have any further questions, you can call 319-975-8283. BREED DISCLAIMER: Many dogs come to us as strays and therefore, we are unsure of their breed. We may actually list a pure bred as a mix because we truly do not know their origins or background and we often must guess at their breed. 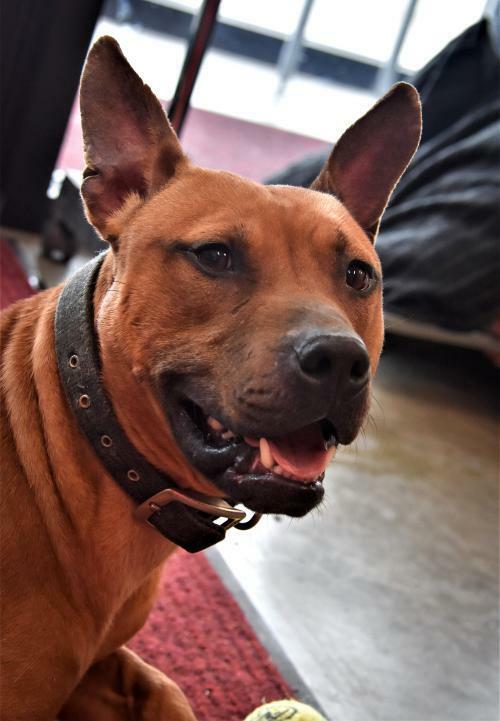 River is a male boxer/pit mix who was born around August 2017 and weights 50 pounds. He was relinquished by his owner who was told by her landlord that she must get rid of him and three other dogs. The adoption fee for River is $175. This includes spay/neuter, rabies, distemper, bordatella, flea treatment, worming, testing for heartworms and treatment, and microchiping. If you are interested in meeting River, please visit the shelter at 22407 Bus Hwy 151 on the outskirts of Monticello during normal business hours which are Tuesday thru Saturday, noon to 6:30pm. If you have any further questions, you can call 319-975-8283. BREED DISCLAIMER: Many dogs come to us as strays and therefore, we are unsure of their breed. We may actually list a pure bred as a mix because we truly do not know their origins or background and we often must guess at their breed. Raja is a female German Shepherd who was born around July 2010 and weights 51.2 pounds. She has not had the best opportunity for socialization with other dogs in her previous homes. 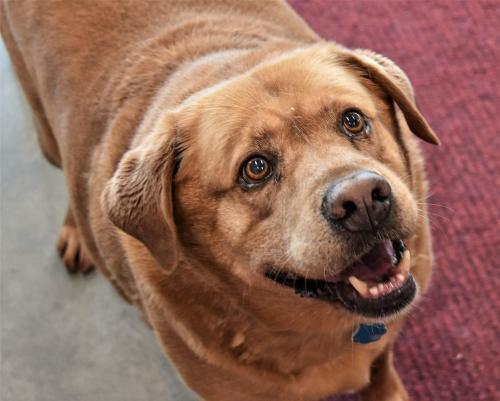 She is a sweet girl who walks well on a leash and enjoys human interaction. She is easy to handle, except that when walking, she barks at other dogs if they are in her sight. She does not lunge or otherwise act aggressive. Raja did escape from a previous home where her owner was physically limited and she was not exercised. She was then brought to the shelter after having attacked a neighborhood cat. Her original owner subsequently adopted her and had her without incident for the last 7 months. The owner then was moving and took her to a shelter, saying he did not have the means to care for her. Raja is a house trained, well-mannered dog, but should be the only pet in the home. The adoption fee for Raja is $125. This includes spay/neuter, rabies, distemper, bordatella, flea treatment, worming, testing for heartworms and treatment, and microchiping. 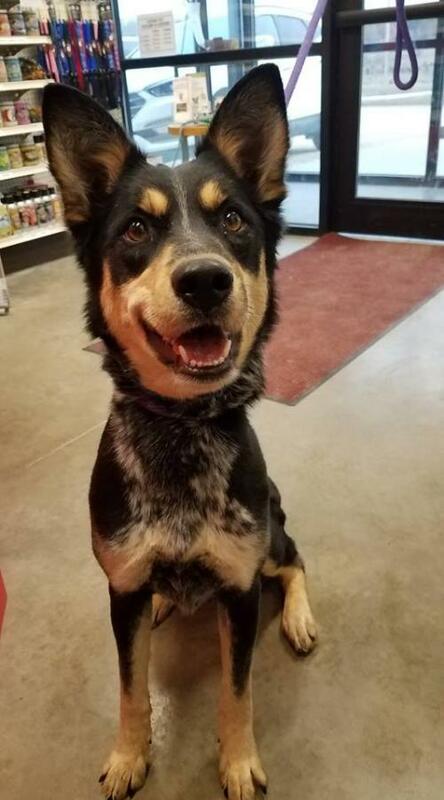 If you are interested in meeting Raja, please visit the shelter at 22407 Bus Hwy 151 on the outskirts of Monticello during normal business hours which are Tuesday thru Saturday, noon to 6:30pm. If you have any further questions, you can call 319-975-8283. BREED DISCLAIMER: Many dogs come to us as strays and therefore, we are unsure of their breed. We may actually list a pure bred as a mix because we truly do not know their origins or background and we often must guess at their breed. 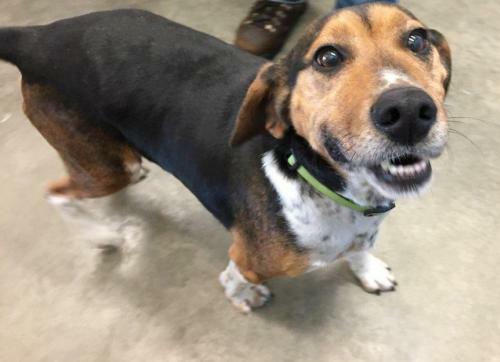 Joe is a male beagle who was born around October 2013 and weights 30 pounds. Joe and Ann, another beagle, have been together all their life. It would be nice if they could be adopted together. They are not housebroken and will kill rabbits. The adoption fee for Joe is $175. This includes spay/neuter, rabies, distemper, bordatella, flea treatment, worming, testing for heartworms and treatment, and microchiping. If you are interested in meeting Joe, please visit the shelter at 22407 Bus Hwy 151 on the outskirts of Monticello during normal business hours which are Tuesday thru Saturday, noon to 6:30pm. If you have any further questions, you can call 319-975-8283. BREED DISCLAIMER: Many dogs come to us as strays and therefore, we are unsure of their breed. We may actually list a pure bred as a mix because we truly do not know their origins or background and we often must guess at their breed. 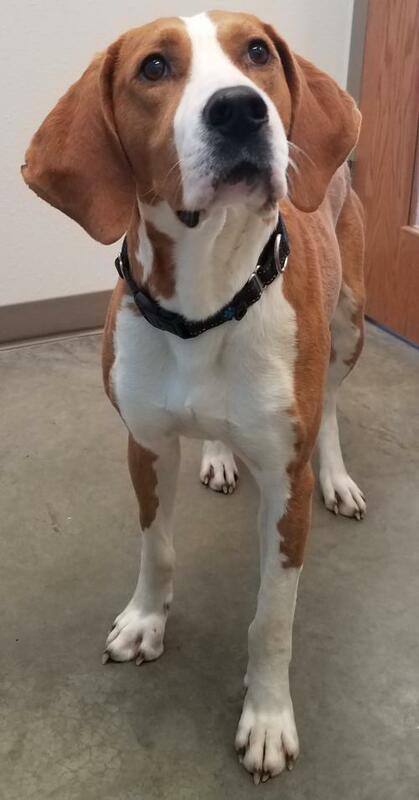 Ann is a female beagle who was born around October 2013 and weights 30 pounds. Ann and Joe, another beagle, have been together all their life. It would be nice if they could be adopted together. They are not housebroken and will kill rabbits. The adoption fee for Ann is $175. This includes spay/neuter, rabies, distemper, bordatella, flea treatment, worming, testing for heartworms and treatment, and microchiping. If you are interested in meeting Ann, please visit the shelter at 22407 Bus Hwy 151 on the outskirts of Monticello during normal business hours which are Tuesday thru Saturday, noon to 6:30pm. If you have any further questions, you can call 319-975-8283. BREED DISCLAIMER: Many dogs come to us as strays and therefore, we are unsure of their breed. We may actually list a pure bred as a mix because we truly do not know their origins or background and we often must guess at their breed. Felix is a male pit mix who was born around May 2017 and weights 32 pounds. He would be best in a home with no other pets. The adoption fee for Felix is $175. This includes spay/neuter, rabies, distemper, bordatella, flea treatment, worming, testing for heartworms and treatment, and microchiping. If you are interested in meeting Felix, please visit the shelter at 22407 Bus Hwy 151 on the outskirts of Monticello during normal business hours which are Tuesday thru Saturday, noon to 6:30pm. If you have any further questions, you can call 319-975-8283. BREED DISCLAIMER: Many dogs come to us as strays and therefore, we are unsure of their breed. We may actually list a pure bred as a mix because we truly do not know their origins or background and we often must guess at their breed. 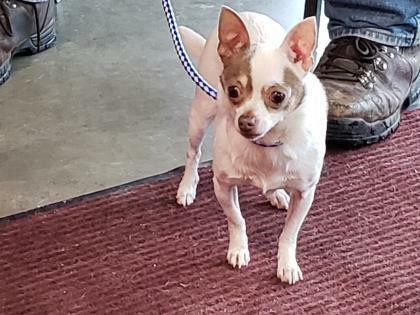 Kelly is a female chihuahua who was born around October 2015 and weights 7 pounds. The adoption fee for Kelly is $175. This includes spay/neuter, rabies, distemper, bordatella, flea treatment, worming, testing for heartworms and treatment, and microchiping. If you are interested in meeting Kelly, please visit the shelter at 22407 Bus Hwy 151 on the outskirts of Monticello during normal business hours which are Tuesday thru Saturday, noon to 6:30pm. If you have any further questions, you can call 319-975-8283. BREED DISCLAIMER: Many dogs come to us as strays and therefore, we are unsure of their breed. We may actually list a pure bred as a mix because we truly do not know their origins or background and we often must guess at their breed. 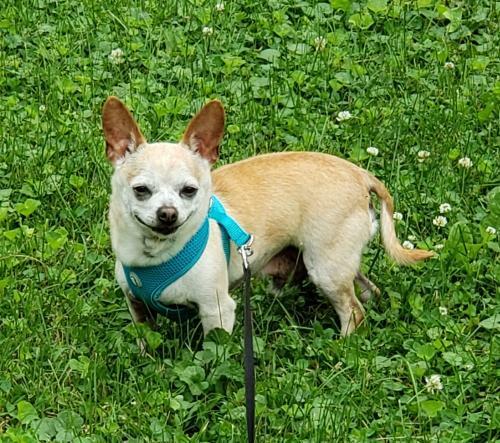 Kinnicki is a male chihuahua who was born around July 1, 2008 and weights 7.1 pounds. He is a breeder surrender. The adoption fee for Kinnicki is $125. This includes spay/neuter, rabies, distemper, bordatella, flea treatment, worming, testing for heartworms and treatment, and microchiping. If you are interested in meeting Kinnicki, please visit the shelter at 22407 Bus Hwy 151 on the outskirts of Monticello during normal business hours which are Tuesday thru Saturday, noon to 6:30pm. If you have any further questions, you can call 319-975-8283. BREED DISCLAIMER: Many dogs come to us as strays and therefore, we are unsure of their breed. We may actually list a pure bred as a mix because we truly do not know their origins or background and we often must guess at their breed. Harvey is a male Husky/Border Collie mix who was born around June 2010 and weighs 47 pounds. He is good with kids and cats, but NO other animals. He most likely has separation anxiety and will chew on furniture, door knobs, etc. He is house-broken. He is an escape artist as well and will work on getting his collar off or pulling a tie-out out of the ground. The adoption fee for Harvey is $125. This includes spay/neuter, rabies, distemper, bordatella, flea treatment, worming, testing for heartworms and treatment, and microchiping. If you are interested in meeting Harvey, please visit the shelter at 22407 Bus Hwy 151 on the outskirts of Monticello during normal business hours which are Tuesday thru Saturday, noon to 6:30pm. If you have any further questions, you can call 319-975-8283. BREED DISCLAIMER: Many dogs come to us as strays and therefore, we are unsure of their breed. We may actually list a pure bred as a mix because we truly do not know their origins or background and we often must guess at their breed. 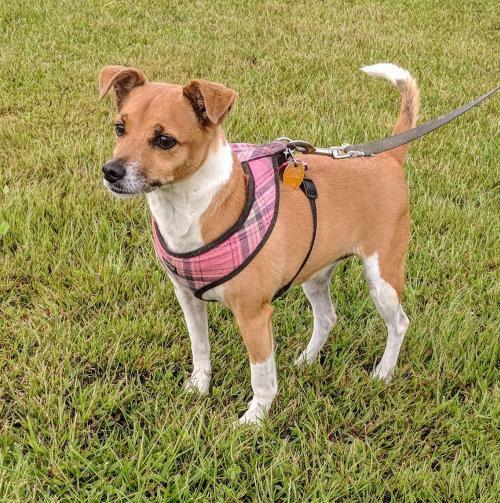 Sadie is a female jack russell/chihuahua mix who was born around July 2011 and weights 20 pounds. She is playful and curious, and likes to run. Sadie will tolerate being held, but sheâd rather walk beside you. Sadie is very particular and does not care for men. She bonds very closely to women, and will become very protective of them. She will need a home without children, other dogs, or men. Women ONLY. The adoption fee for Sadie is $125. This includes spay/neuter, rabies, distemper, bordatella, flea treatment, worming, testing for heartworms and treatment, and microchiping. 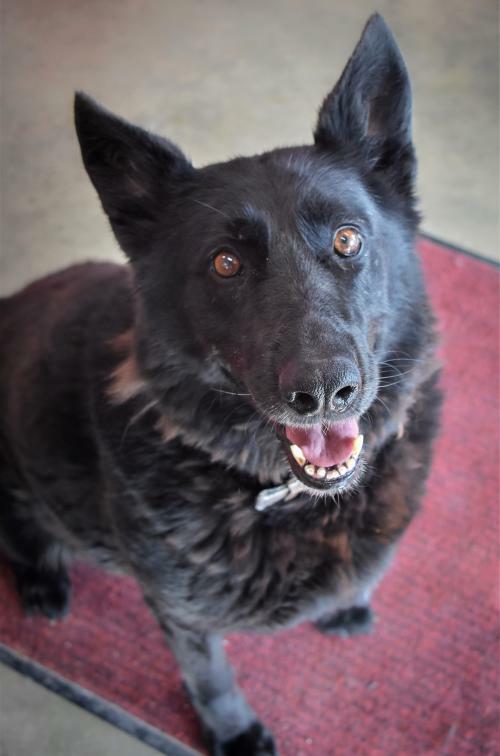 If you are interested in meeting Sadie, please visit the shelter at 22407 Bus Hwy 151 on the outskirts of Monticello during normal business hours which are Tuesday thru Saturday, noon to 6:30pm. If you have any further questions, you can call 319-975-8283. BREED DISCLAIMER: Many dogs come to us as strays and therefore, we are unsure of their breed. We may actually list a pure bred as a mix because we truly do not know their origins or background and we often must guess at their breed. Charlie Jo is a female pit bull terrier who was born around October 2012 and weights 48 pounds. 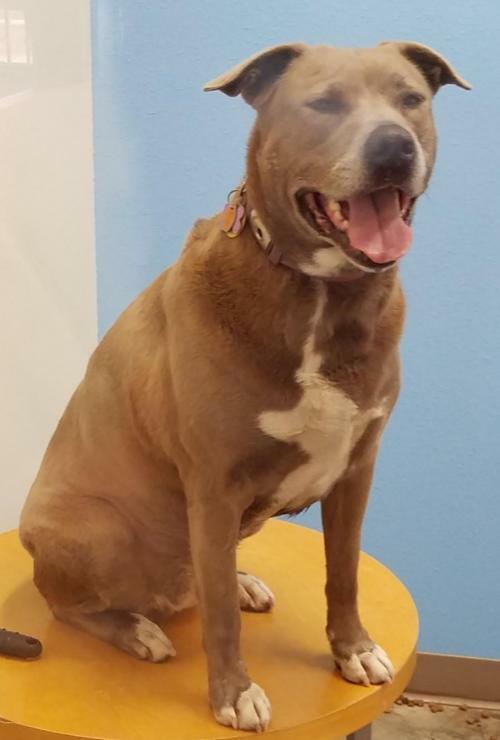 She is a happy dog, and a sweetheart who loves playing and cuddling. She is fairly calm, is house trained, and gets along well with children. Charlie Jo was relinquished by her owner due to not having enough time to spend with her. She has some grain allergies that cause her to have sensitive skin. She prefers to be the only animal in the home. The adoption fee for Charlie Jo is $175. This includes spay/neuter, rabies, distemper, bordatella, flea treatment, worming, testing for heartworms and treatment, and microchiping. If you are interested in meeting Charlie Jo, please visit the shelter at 22407 Bus Hwy 151 on the outskirts of Monticello during normal business hours which are Tuesday thru Saturday, noon to 6:30pm. If you have any further questions, you can call 319-975-8283. BREED DISCLAIMER: Many dogs come to us as strays and therefore, we are unsure of their breed. We may actually list a pure bred as a mix because we truly do not know their origins or background and we often must guess at their breed. Whinnie is a female shephard/beagle mix who was born around March 20, 2016. She is moderately active and loves to run and play with toys. She can be a little shy at first, but when she warms up to you, she is very friendly. You do have to go slow with her at first as she is a little insecure. Due to her insecurity and her bone-guarding tendencies, we do not recommend she go to a home with small children. She also prefers to be the only dog in the home. Whinnie has gone through puppy training and knows the following commands: Give a kiss, sit down, shake, leave it, play dead. She also walks well on a leash. She does guard her bones, but not her food. The adoption fee for Whinnie in $175. 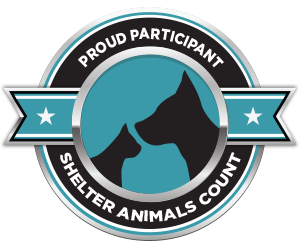 This includes spay/neuter, rabies, distemper, bordatella, flea treatment, worming, testing for heartworms and treatment, and microchiping. If you are interested in meeting Whinnie, please visit the shelter at 22407 Bus Hwy 151 on the outskirts of Monticello during normal business hours which are Tuesday thru Saturday, noon to 6:30pm. If you have any further questions, you can call 319-975-8283. BREED DISCLAIMER: Many dogs come to us as strays and therefore, we are unsure of their breed. We may actually list a pure bred as a mix because we truly do not know their origins or background and we often must guess at their breed.